My Goodness, It’s been ages since we have given any kind of update, which might lead one to assume that all has been calm on the bay front but it’s actually the complete opposite! Spring led us to Doernbecher Children’s Hospital where we obtained some very useful information but between her short baseball season and additional appointments we have been noticeably absent from our virtual home. We have many posts coming soon about all Mermaids new discoveries throughout Spring but today there is one main issue at the forefront of our fins. I distinctly remember one of our very first appointments a brief mention that “she may have some blockage of her sweat glands” and that was that; until now there has been very little thought placed on that statement but I never forgot. Summers have always been fine, she often claims she is “hot” on a regular basis and keeping clothes on her is a mission in itself but honestly, I chalked it up to being normal with NO concern whatsoever. About a month ago we were at an outdoor birthday party, the day was especially hot for our area and the yard offered little to no shade. They had games with water balloons, plenty of cold fluids and ice cream so even though it was a scorcher, everyone tolerated it just fine. Mermaid has long been asking for a new play kitchen and the little girl celebrating her big #5 just happened to have one in the house along side her Mom’s real kitchen. Throughout the party I kept finding Mermaid in the house near that kitchen, My initial thought was that she just wanted to sneak off and play with it so I continuously led her back out to the party in the yard. She participated in a game where they placed water balloons on a spoon and had to run to the end of the yard and back without dropping their balloon. As I stood at the end taking pictures I noticed she seemed more flush than anyone else. When they were done she quietly went and sat on some steps by a bubble machine. I snapped a picture and when I set my phone down I noticed her color had drastically changed to a purple shade and her breathing seemed somewhat labored. I went from this is just normal hot weather behavior to “Oh my Gosh what is happening” in 2.7 seconds flat. I scooped up Mermaid and ran her in the house, she had no energy and I took her dress off as quickly as possible. For the first time in our lives I instantly knew what was happening. She was truly overheating. The left side of body where her nevus lives was bone dry and the right side was drenched. She begged me not to put it back on and began to cry. Within minutes I apologized and rushed her to the car and blasted the a/c. By the time we got home, almost 45 min later she was still roasting and eventually threw up. I felt terribly guilty for having her out in the heat like that and prayed it was a one time fluke. Not so lucky, a few weeks later we were at a family members graduation party, again, it was a hotter than normal day for the PNW and we were outside. We were at my brother’s house and there was a bit more shade than the previous party plus they have a small pond that the kids typically flock too to catch frogs and tadpoles. More aware of her potential to overheat I kept a closer eye on her and just like clockwork, she went from fine to that scary shade of purple again within seconds. This time family was present and keeping an eye on her as well and because she refused to miss the chance of catching a frog we made her continuously return to the table for drinks of cold fluids, gave her ice cubes to hold and a wet cold rag to hold on her face and neck. Just as before the concern grew to the point that we chose to make an exit but this time left before it got so bad she threw up. Below is a picture from the 2nd event, not the most flattering but imagine, the first time it happened her face looked WORSE than it does here! Just yesterday we went to visit my parents at an outdoor market where they had a booth set up, it was significantly cooler than the other two days that incidents occurred but still hot and I was very aware of the potential. She started out by sitting in my parents chairs eating some lunch we brought but shortly found a table in the shade behind their booth at a local restaurant. She seemed happy there but a worker quickly approached us and asked us to leave the table. I kindly explained that she would be done eating in 2-3 minutes and pointed out that there were multiple other open tables so I bought Mermaid a short window but her retreat from the direct sun ended quickly. We were not there long before she sat on the ground and proceeded to try to take her clothes off. I quickly stopped her and said No baby, not in public, when she grew weepy and said she couldn’t wear her clothes anymore. She proceeded to tell everyone she was too hot and that was my queue, off we went. Once in the car and a/c she used my water bottle to hold on her face and neck and kept asking me to turn the air on, despite the fact that it WAS on and cold enough I was looking for a sweater. Within minutes of being home she threw up. Daddy and I go her some cold ice water, a fan and had her lay down to rest while continuing to cool off. So here we are, a random overcast day and I am reaching out. My gut says that this reaction is linked more to the EHK than LEN and is just now coming to life as her Nevus has slowly spread & thickened over her sweat glands on the left side. I can not find any direct information linked to her LEN that suggests this is a potential side effect but most Ichthyosis articles have share a direct link to overheating. Additionally, I read an interesting piece stating that the rapid turnover of cells in individuals with Ichthyosis require more energy thus meaning the host needs more calories to grow. Maybe, JUST maybe, this could be a link to Mermaid’s insatiable need to always be snacking like a teenage boy. I also cannot say that any of our followers with ILVEN or LEN have spoken to this directly and perhaps those with congenital, Giant or Ichthyosis can shed more light on this topic? Mermaid falls in this weird category where she has three (One we recently received @ Doernbecher that we will share later) separate diagnosis working together to complicate the understanding and treatment. Is it simply that we need to acclimate her body leading up to summer or trips to warmer climates or is there truly no way to prevent it? Will sports be an issue? I am reaching out today looking for your expertise, tips & tricks to help us in our newest conundrum. I am at a loss as to who we should go to first to discuss it. Her PCP, her dermatologist or her genetic specialist @ the children’s hospital. Help guide us! Coming up we have a new trial of a natural homemade cream thanks to a local friend, will dabble in some more salve making ourselves with intentions to get some out to a few of our special followers and a post about some other new discoveries added to Mermaid’s ever-growing list of diagnosis. If you have experience in the overheating world please share your thoughts! We look forward to hearing your expertise and jumping back in to some nevus focused time! This is my life book. It has been by my side for almost 6 years now. It is always near me. I carry it in my bag and it’s rare the two of us are far apart. When I get to work, I take it out of my bag and set it next to my computer. It’s tattered, torn and hanging by a thread, but you know what – it’s full of so much love. Inside this book are my ideas. Those pop in your head, don’t want to lose them ideas. It has over 5 years of finances carefully listed and checked off month after month. It has party invites, my step son’s 8th grade graduation program, Mermaid’s official pathology report from September 2015, a picture of a friend I just lost, stuck through the back pages is a guardian angel pin gifted to me. Some of the pages are burnt as I was writing in it one night by the fire when I was pregnant and a hot ash caught it on fire. It holds a card my husband made me, a goodbye note from a Physician & friend I highly respected that moved away, a list of all the places I want to visit and a recipe my Mom hand wrote. Just last week the entire cover started tearing off and I taped it up with scotch tape. One would think I could just go buy a new one but it holds sentimental value. As I was taping it up I thought to myself, this is kind of like my life right now. Barely held together, full of so much love, but in need of a new shell. You see, these past few weeks have been more trying than I can even begin to explain. Mermaid had what I thought was nevus starting to grow on her face, the moment it started to bleed I finally took her to urgent care, with no answers we were led back to dermatology and thank the Lord, it just ended up being eczema but we are now battling that. I have had some challenges at work and been faced with making very difficult decisions, I have had to allow myself to be vulnerable, fight anxiety and search within for what was the right thing to do. A few days ago I woke up overcome with grief. I sat down in the shower and sobbed, missing my friend who passed a few months ago. Her passing is still fresh and has completely altered my life. I barely made it to work and while there, I wished I cold just get in my car and drive to heaven to have a cup of coffee with her. That being completely unrealistic, I contemplated driving anywhere, just going, clear my head, but I didn’t. I stayed, I held up my responsibilities and tried to power through. Mid-week I told myself to shake it off. I have so many blessings and hard times will come and go. Find a new shell. She didn’t know about my life book until I told her that morning, she just knew I was struggling to find peace. She gave me my new shell. It’s easy to forget our blessings, to dwell and struggle to find our footing; and that’s ok because somewhere along the way, something small will remind you. Give you a breathe of fresh air and a chance to start new. I put some of my hard decisions in motion, I started yet another nightly routine for Mermaid’s skin and I talked to my friend driving home that day. Ok, so I talked to myself, but I know she heard me. I told her to help me find a way to let go, not forget, just let the grief go. Yesterday Mermaid was suppose to be cleaning her room but instead she made me a bracelet. She was so proud of herself and asked me to wear it to work. When we got home today she found it on the table and said “Mommy, you forgot to wear your bracelet to work” – ashamed, I apologized. A few minutes later she came out of her room with a different bracelet and said it’s ok, you can wear this one, it’s your favorite. This was not my favorite bracelet, it’s not even mine, it’s hers. She can’t possibly remember where it came from and why she said that, or chose it, I can’t explain; but I remember where it came from. A few year’s back, my friend that passed, gave it to her while we were visiting in Seattle. Maybe it was her small way of reminding me of the good times, telling me it’s ok and that she heard me. 1.Because I have an amazing family that supports my every move. 2.Because I know deep down inside, the hardest decisions are often the right decisions. 3.Because as of now, Mermaid has no complications as a result of her disease & we can jump any other hurdles thrown our way. 4.Because I have 18 amazing years of memories with my late friend to smile about, not cry about. 5.Because when we think nobody is listening, they are. 6.Because today, I felt the sunshine on my face for the first time in a while and it reminded me that the clouds always clear. 7.Because the positives I gain through work outweigh all the negatives. 8.Because I am slowly learning, 35 years into this life, that it’s ok to stumble as long as you get back up. My Dear Kathy – I thank you for my new shell and your humorous but powerful words. I thank you for listening. I thank you for reminding me of the good. My promise to you is to listen to someone else, and when they least expect it, send them a new shell. Today, you are an honorary Mermaid. Well hello there! Welcome to 2017! We last left you a note that we were taking the holiday season off and that’s just what we did; but it’s time to dive back into things. As I’m sure you all know, the holiday season can be all encompassing. We wanted some time to focus on another project and be present in all the winter festivities. Some things went as planned and we promise to share about that later but honestly, life had a different plan for us these past few months and we went through some personal struggles regarding loss. That too, we will share down the road but I’m not quite ready to go there. For now, let’s catch up on where we are at in the Nevus world. We gained some new followers during our break and fresh faces are always looking so I will give a quick reminder of why we are here. My daughter was born with Epidermolytic Hyperkeratosis, specifically Aconthotic and hyperkeratotic epidermis with focal dyskeratosis including linear epidermolytic epidermal nevus and epidermolytic acanthoma, a hemangioma and a stork bite, also a form of nevus, on her neck. The hemangioma never grew, it’s the same size now as it was at birth but her stork bite, also a form of nevus, has continued to grow and her LEN has opted not to slow down. In comparison to others we feel blessed, her LEN remains light in color and relatively flat but continuously changing. What does all of that even mean? Broken down, it essentially means she has EHK and LEN. Linear Epidermal Nevus (LEN) is a rare genetic skin disease effecting about 1 in 100,000 people that typically effects the limbs and torso. Her particular kind sticks to one side of the body, in our case, her left side. In infancy it is light tan and flat but will thicken, darken and often become warty as one ages. There is a possibility of skeletal, bone, ocular and neuro abnormalities that may develop; in which case it would be consider a “syndrome”; the lesions alone do not indicate a syndrome. There is a chance that the lesions may develop tumors, some benign, some cancerous. Open lesions are susceptible to infection, causing further health risks. About one in five people will experience a malignant cancer in their lesions. There are many other forms of Nevus including Congenital, Sebaceous, giant, and closest in kind, ILVEN. It is caused by a genetic mutation in the ectoderm during gestation. At this time there is no “cure” – though there are potential medicines and procedures to help with discomfort and visualization. Occasionally, surgery will be warranted if the size or site indicate so. Excision is the only true “cure” for LEN or ILVEN. The rest is all maintenance so it all depends on how severe your specific case is. The subtype of Epidermolytic Hyperkeratosis (EHK) is even rarer than LEN. It effects about 1 in 250,000 people and makes Mermaid’s skin fragile. There are two types of EHK, my daughter’s is the NPS type. We will explore that more this coming year. The dyskeratosis and aconthosis is a fancy way of saying there is an abnormalization of the skin keratin causing thickening. Additionally, Mermaid’s disease is growing on her hand, over the joints. Nothing has been set in stone but all 3 dermatologists have mentioned the potential of needing excision surgery near school age. We are a ways off from that so I can’t speak to that more than saying it is a possibility. One of the first things we were told was to be aware of was the potential of developing “Wilm’s tumor” – childhood kidney disease. This has been controversial from source to source but nonetheless, is there. She will officially be in the clear at age 6. Over the past few months Mermaid has developed a new spot on her back and the base of her skull that are itchy, raised and extremely bothersome. We are waiting them out to see if they progress but will probably go in to have them checked soon. Where we are today is night and day to where we began. In the beginning I was scared, plagued with anxiety, confused and uneducated. I now have a good grasp on what we are dealing with and the anxiety has mostly subsided. I say “mostly” because there is always that lingering fear of cancer, be it in the form of melanoma or kidney cancer, that, I will never shake, though it is far from the forefront of my mind, more of a foot note. 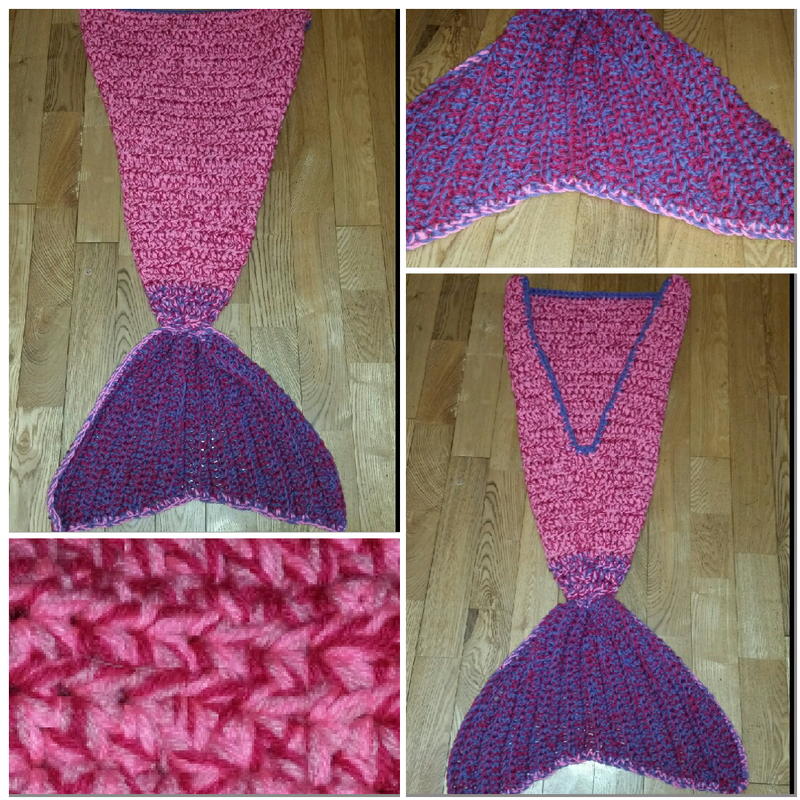 We have grown so much as a result of my relentless research and support from everyone here at Mommy’s Mermaid. To our new followers, we welcome you, and thank you for joining us, to those just browsing, thanks for stopping by, and for our long time friends and followers, we appreciate and love you all. We look forward to spending the next year sharing our journey, hearing your stories and hopefully making progress and new discoveries in the nevus world. We have so many talented people in our lives; from top chefs and bakers, to woodworkers and tanners. One special friend is a master at crocheting, you know… that thing with yarn. Crocheting came around in the 1800’s and has long had a place in history. In the 20’s you saw it being worn in the form of hats & dresses then in the 40’s it became part of the wartime effort, women making items for the troops. In the 50’s & 60’s the art exploded, patterns blew up and you could find items nearly everywhere, if you have never checked out some of the crocheted clothes from the 60’s, you really should do yourself the service and look it up! It seemed to fade off a bit, the world was changing fast and it was kind of left behind, but not for long…. Today you can find blogs, websites, patterns, pretty much anything your heart desires to see and know about the crocheting world right at your fingertips on the world wide web. There seems to be this age-old argument of what’s easier or better? Crocheting or knitting? I personally have tried both, and I personally can NOT do either one. It’s not my strong suit. Which makes me thankful to have someone in our lives that holds this talent! She loves her tail, and I love that it was made by someone special. 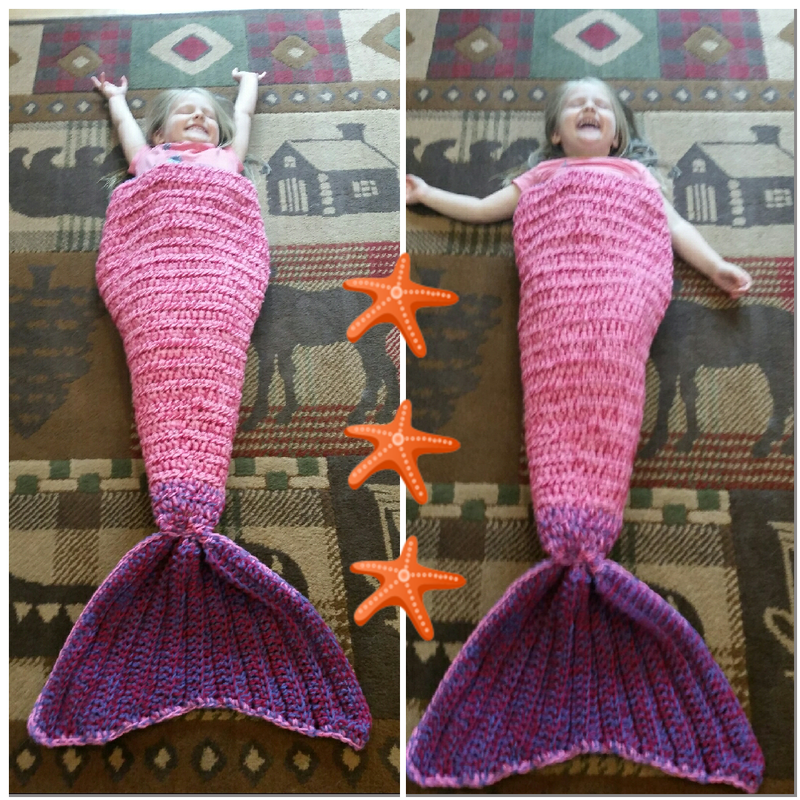 The other day Mermaid came up to me in the kitchen and said “Mama, I don’t want my scales to go away”, I said good, because they’re yours to keep! her response? “because the mermaid’s made a spell that gave them to me!” and I told her that was right. Her wanting to keep them is a far cry from a few weeks ago when she told me they were disgusting, so I will embrace it. The gift means so much to us, to have people that embrace her story and help cheer her on in all the smallest of ways warms my heart. We thank you for our gift! Molly is truly talented and I encourage you to take a look at her online shop. There will always be new things added!